The C Strcmp function is one of the String Function, which is used to compare two strings and check whether those two strings (group of characters) are equal or not?. The basic syntax of the strcmp in C Programming language is as shown below. The following function will accept two character arrays as the parameters. And, it will compare the string data in both the arrays and returns the integer output using the built-in String function strcmp. str1: This argument is required. Please specify the valid string to perform comparison. TIP: You have to include the #include<string.h> header before using this C strcmp string function. The strcmp function is used to compare two strings (character array) and returns the integer output. 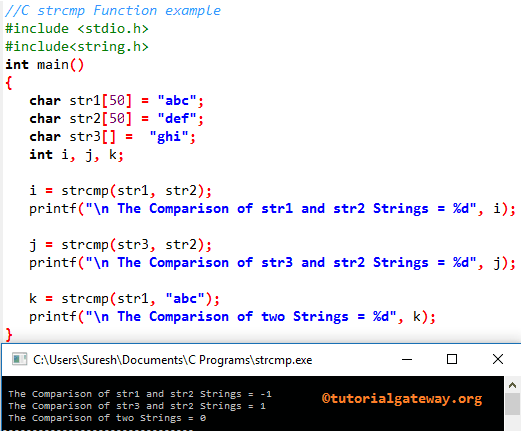 This C program will help you to understand the strcmp (string compare) with example. Within this C strcmp function example, First, we declared three character arrays str1, str2, str3, and we assigned some random string data (group of characters).